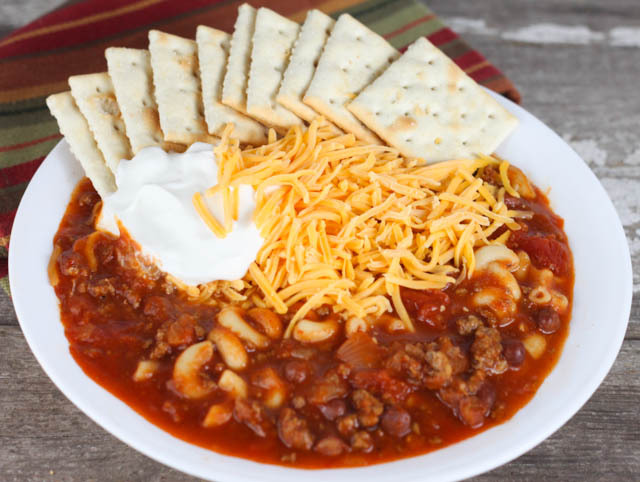 This Easy Chili Mac is a one pot meal that the whole family will love, that is made with ground beef, chili beans, macaroni and topped with cheese! 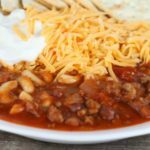 I will be honest chili can sometimes be quite the controversial topic, pasta, no pasta, beans, no beans, spicy, not spicy etc. 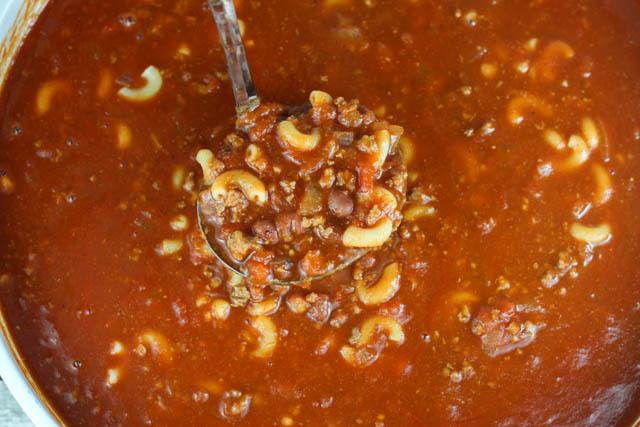 If this is not your type of chili no need to stick around or comment. Just go surf the net for another recipe closer to your liking. My family loves this recipe. Even my picky toddler will eat it if I add some more noodles and lots and lots of cheese! This recipe is what I would call family friendly and not that spicy. 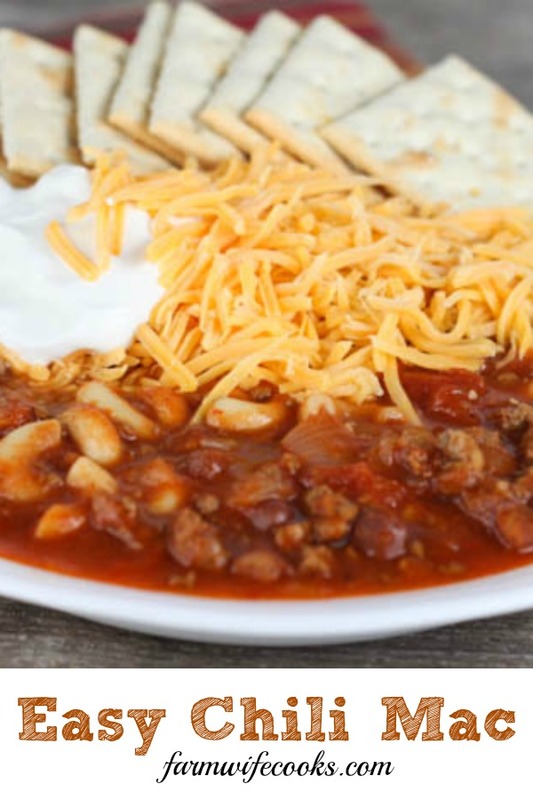 You could kick up the spice by adding more chili powder. I honestly had to pay very close attention the last couple times I made this because I don’t normally use a recipe but I wanted to make sure I had the amounts correct for you all! 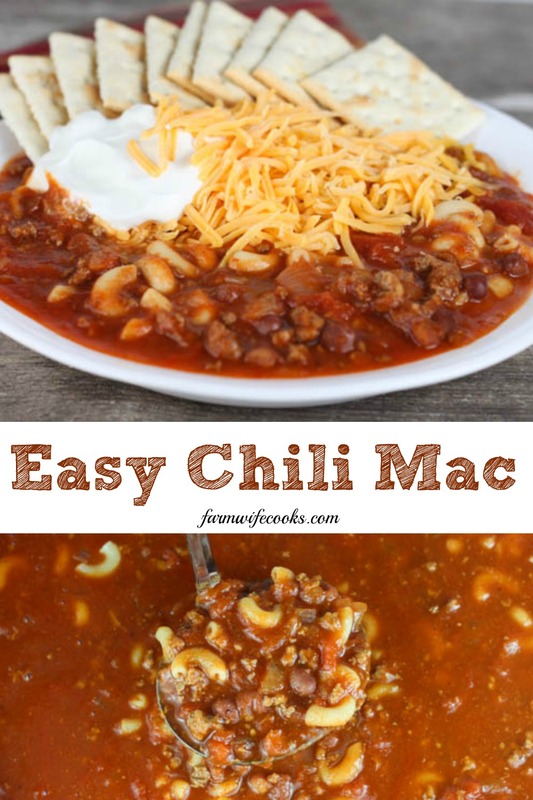 Easy Chili Mac is easy to toss together and tastes better the longer it sits! The pasta will get a little mushy the longer it is cooked so I usually add it in right before serving. In the summer when I have fresh green peppers I often add about a 1/4 – 1/2 cup to give it a little extra flavor. Serve with crackers, shredded cheese and sour cream. We also love this Creamy White Chicken Chili. In a large skillet brown the ground beef until no longer pink; drain. Add the onion and minced garlic and saute until onions are translucent. Add the diced tomatoes and let simmer for a couple minutes. Add remaining ingredients (except pasta) and cook on low for 30 minutes. Add noodles and cook for 10 minutes longer before serving.